We all know someone who fancies themselves as a bit of a Carluccio in the kitchen and this hamper is the perfect gift for them!! With this collection of top quality Italian ingredients they will be able to create some amazing dishes. There is everything they will need from Neapolitan super-fine flour for perfect pizzas to the best tinned tomatoes in the world for superb pasta sauces! This gourmet selection comes in a beautiful, large wicker hamper tied with a big colourful ribbon. Gourmet Herb Salt (200g) A completely natural blend of Sicilian sea salt and Pink Himalayan salt flavoured with a blend of herbs. Excellent for just sprinkling on your salads, pasta dishes or vegetables to add flavour and aroma. Great for cooking with, especially for seasoning and flavouring roast, grilled and boiled meat. Brilliant for flavouring sauces too! Organic Garlic and Black Pepper Infused Olive Oil (250ml) Created by combining two Italian classics - organic Balsamic vinegar from Modena together with organic, single estate Ottobratica olives, this unique oil is beautifully balanced, tasty and healthy. It is very low in acidity (just 0.2%) and high in polyphenols (the anti-oxidants that are said to help prevent cancer, arteriosclerosis and slow down the ageing process). Caputo Extra Fine ‘00’ Flour (1kg) Now you can make real Italian pizza at home! Caputo flour is recognized as the world’s best pizza flour and is used by 80% of pizzerias in Naples! If you have already tried making pizza at home and haven’t had much success, we think that switching to this flour will make all the difference! Fig Balsamic Glaze (150ml) This fig balsamic cream glaze has been made by the Giusti family in Modena by skillfully reducing aged balsamic vinegar without the addition of any caramel or colouring. It has a thick consistency, a fine velvety texture and an exquisite fig flavour. Popular with chefs, balsamic glazes are easy and versatile to use at home, giving a fabulous finishing touch to a range of dishes. Sun Dried Tomatoes (250g) Bring some Italian sunshine to your dishes with Vorrei’s sun dried tomatoes from Calabria. They can be used straight from the packet or rehydrated. To rehydrate them place the tomatoes in a bowl and cover with boiling water and leave until the tomatoes are plump and juicy once more (reserve the liquid to add flavour to stocks and sauces). Organic Capers in Sea Salt (250g) The Aeolian Island of Salina, one and a half hours north of Sicily produces the finest capers in the world. The capers grow naturally and are of course organic, they are also a Slow Food product. Capers will add a natural richness and depth of flavour to al your favourite sauces, soups, salads, stews, rice and pasta dishes. Calabrian Wild Oregano (50g) Our dried oregano has an intensive aromatic fragrance. It's wonderful for flavouring tomato pasta sauces and for sprinkling on tomato bruschette. Liquorice Powder (80g) Naturally sweet and full of flavour, this organic liquorice powder is a fantastic ingredient for experimenting with in the kitchen. This powder is ground from the organically grown liquorice root in Calabria. It gives an incredible aniseed flavour to your recipes and can be used in desserts such as chocolate mousse, Tiramisu, ice cream and semi-freddo, in risottos, pasta dishes (or even to flavour fresh pasta dough), and in a variety of meat and fish dishes. Amalfi Coast Colatura di Alici (100ml) Our colatura di alici from Cetara is an aromatic and fragrant amber liquid that is easy to digest, is rich in vitamin A and enhances any dish. It can be seasoned with fresh herbs such as parsley, garlic, paprika and some lemon zest and added to extra virgin olive oil to create a wonderful sauce for spaghetti or linguine. Or just simply drizzle over bruschetta or grilled vegetables. A little goes a long, long way. Amalfi Coast Anchovy Fillets (80g) Fresh anchovies are an oily fish that look and taste similar to sardines. Our fillets of Cetara anchovies from the Delfino Battista family on the Amalfi coast are preserved in sunflower oil and are a healthy ingredient for any dish. Use them in numerous sauces, salads, in pasta or to create a delicious antipasto. Calabrian 'Nduja (180g) This cured, spreadable salami is flavoured with herbs and lots of spicy chilli! Gragnano Gran Riccioli Pasta (500g) Our Pasta Gragnanese Gran Riccioli not only taste better and retain all of their goodness when cooked, they also have plenty of surface area to absorb the flavour and liquid of the sauce with which it they are served. Gran Riccioli means 'Large Curls' and this corkscrew like pasta is the perfect shape for capturing all types of sauces from fish to meat, ricotta to vegetable. Carnaroli Rice (1kg) From the famous Northern rice fields of Vercelli, this rice holds its shape really well when cooked and is perfect for risottos. Amalfi Dried Pasta Sauce Mix (50g) Make a delicious pasta sauce in minutes with this handy mix, just add tomatoes and olive oil! 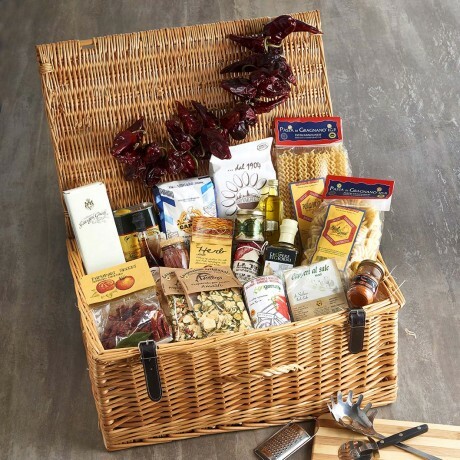 Our Italian Chef essentials are presented in a quality wicker hamper tied with a ribbon. A gift message option is available at the checkout. Please note that if we are out of stock of any item we reserve the right to substitute it with the most similar available item. Chillies and kitchen utensils are for photographic purposes only and are not included in the hamper. Allergens: butter, wheat, sulphites, capers, anchovies.